Farmstays, dude ranches and farm-stay holidays on the far north coast, Northern Rivers (Byron Bay, Tweed Valley, Upper Clarence) and Gold Coast hinterland region, NSW - QLD, SE QLD, country NSW, Australia. Australian country holidays, holiday farms and vacation ranches. Farmstays, farm stay accommodation and host farm holidays in the Northern Rivers of New South Wales, Gold Coast Hinterland and Scenic Rim region of Queensland, Australia. You'll find a great variety of farm stay, country vacation and ranch style lodgings in the Northern Rivers region, from the Ballina coast and Byron Bay, to the Gold Coast hinterland and beyond in the Scenic Rim backcountry. Properties include cattle farms, horse riding and agistment ranches, orchards and plantations. At working farms you can often participate in or observe farm routines and children have the chance to see and feed animals. Experience authentic Aussie country hospitality, where you and the kids maybe able to join in farm activities or just take it easy and let your hosts take care of everything. Activities like horse riding, bush walking, canoeing, bicycling, archery and fishing are often available on-site or nearby. Hosanna offers a range of affordable accommodation options including comfortable cabins, "safari huts" to suit families, couples and singles, and a primitive camping ground with powered and unpowered sites. Facilities include communal lounge, kitchen and dining area, laundry, internet access, and a wood fired sauna next to our swimming and kayaking dam. 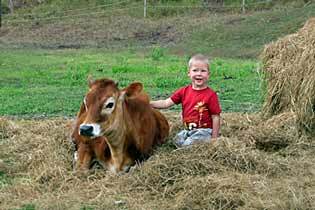 Kids can help with feeding the animals, collecting eggs, and try milking the cows. We're also dog friendly (camping area only). From	AUD $12 pp pn. camping to $160 pn. for cabins. Day visitors welcome - $. Self-contained cottages set on a stunning 300-acre farm in the Byron Bay hinterland. Explore the farm's walking and mountain bike trails, or enjoy free use of canoes, kayaks and rowing boats on our lake. Children can feed farm animals, including cows, chickens, and horses. Mooyabil farm is set on 100 acres and is a working beef breeding farm. Guests can see cows, calves and horses. Accommodation is fully self-contained 2 bedroom apartments. On-site facilities include a swimming pool, children's play area and games room. Offering accommodation with breakfast included, guests can enjoy feeding the sheep, chickens, and horses. There is also a children's playground and a tennis court. All accommodation has a lounge area with a flat-screen TV, and a kitchenette or kitchen. If you don't feel like cooking, the restaurant serves lunch and dinner on request.